When you complete your order in the online boutique you’re browsing, the items you order may be shipped only within the country specified. If you select a different country for delivery, the prices, general terms, and availability of the items may change. For further information, see the shipping section. Your request has been received, we will conctact you as soon as possible. A retro motif updates the style of the pure cotton new cardigan. At the base of the piece, the contrast color striped pattern is paired with an inlaid embellishment that uses yarn with a bouclé effect to create a geometric pattern with a slightly voluminous look. The Garza technique of the cotton yarn, lightweight and substantial at the same time, gives the garment a balanced weight, ideal to wear in the spring. A shawl collar and the horn buttons closure complete the style of the sweater, which offers a regular fit. The pure cotton yarn is made with a Garza technique, a process which leaves the stitches wide to make the garment lightweight and comfortable, ideal to be worn during the summer season. 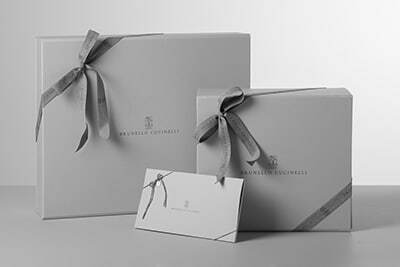 Our products are created in the hamlet of Solomeo and produced in Italy, with respect for people, the dignity of work and in harmony with the land. Hand wash only. Dry garment on a horizontal surface, iron at medium temperature. Alternatively, delicately dry clean garment. Our garments are always shipped free of charge. We guarantee 30 days to returnor to exchange an item, a service which we are pleased to offer free of charge to all our clients. 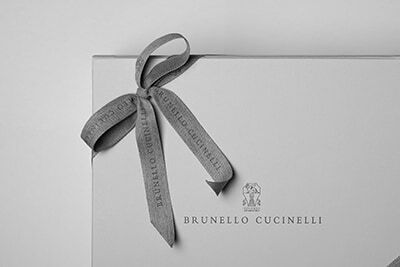 Our exclusive packaging, designed to enhance and protect your articles, has been made especially for our Online Boutique in our Solomeo workshops. The belt length is measured from the buckle to the end of the belt. To understand what length best suits you, measure your waistline at the height you would like to wear the belt. Measure your hand at the height of the knuckles, without including your thumb. Measure the circumference of your head right above the eyebrows. The measurement obtained in centimeters will correspond to your European size.